Are you ready to create a life of bliss? Hey you... 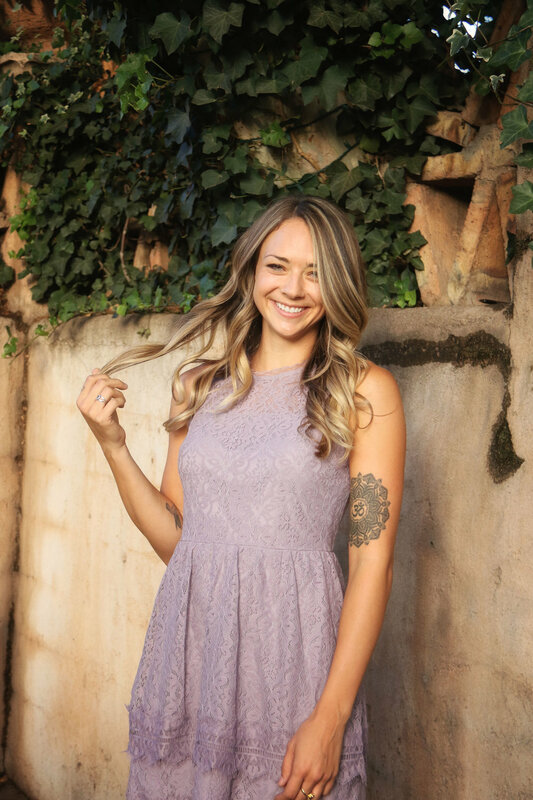 I'm Lauren, and I'm here to help you remember what it's like to trust & love yourself, reconnect to your intuition, gain massive clarity on your dream life, and take courageous action toward making it a reality! I'm a women's Integrative Life Coach, yoga instructor (RYT 200), writer, mentor, and a perfectly imperfect human on a mission to empower you to become the best version of yourself. My coaching practice is focused around helping you reclaim responsibility for your life, happiness, and wellness through mindset work, spiritual growth, and personal development, so that you can design your days to have more balance, inner peace, and BLISS. You will become the hero of your own story. You will BE your bliss! Becoming the best version of yourself means surrounding yourself with people who lift you up and inspire you. Be Your Bliss is a FREE Facebook group filled with purpose-driven humans (like you!) who have gathered together to motivate, inspire, and empower each other. Join us for free self-love challenges, inspirational content, motivation, and to make new friends! Sign up to receive inspiration, freebies, and LOTS of love & inspiration directly to your inbox! We respect your privacy and promise to keep our content high-vibe! Are you ready to discover the "something more" out there that you've been looking for? To move past the fears and limiting beliefs that have been blocking you and keeping you stuck? Are you ready to work with a coach who will inspire, motivate, and hold space for you to become the BEST version of yourself? If so... read more about working with me 1:1 and book your complimentary discovery call today! How do you create a life of bliss? It starts from the inside out. If you feel uninspired, unmotivated, stuck, unfulfilled, and unclear on what you want in your life... it's probably because you have lost connection to your True Self. Do you constantly look to others for answers? Have you been seeking advice, approval, acceptance and validation from your relationships, jobs, career, family, friends, and everything on the outside? Is there another part of you that just knows there is something more out there for you? That you were made for more than this? That you don't want to settle into an average life... but you don't quite know how to break free from where you're at now? If so... you're in the right place! I'm here to show you what it's like to reconnect to your True Self (the most authentic, courageous, brave, inspired version of yourself... not the self you've been pretending to be for the outside world), and create the life you were actually BORN to live. I'm a Certified Integrative Health & Wellness Life Coach and Yoga Teacher (RYT 200) currently living in Phoenix, AZ. But those are just labels attached to my name... and I hate labels. "Lauren is pure magic! Every single day I am so grateful that I made the investment in myself by choosing to work with her." Are you ready to get crystal clear on your life purpose + big vision? Ready to drop the struggle around money, relationships, body image, self-confidence, business, and LIFE in general? Do you want to wake up every morning and feel in alignment with your truth, taking courageous action toward your dreams, and actively becoming the BEST version of yourself? Ready to fall back in love with yourself and your life? To become the hero of your own story? To be your bliss?! I'm here to help you bust through the fears, limiting beliefs, and old stories you've been carrying about who you are that are keeping you stuck. Our coaching will help you get clear on what it is you want to create in your life and WHY, to reconnect to your inner truth, to remember your life's purpose, and to create a life revolving around what you truly desire the most. I help high-achievers, recovering perfectionist and people-pleasers remember how to LOVE themselves, trust their intuition, and become the hero of their own story... so you can create a life of bliss from the inside out! Schedule your complimentary discovery call with me to find out if we're a good fit to work together + create some massive change in your world!